Our tacos are topped with a cheddar/jack blend, with sides of black beans, rice, fresh limes, wasabi sauce and choice of pico or mango salsa. *Taco seasonings: Blackened, jerked or garlic curry. *Taco shell choice: Red chile flour tortilla (soft shell), or corn (crispy or soft shell gluten free). *Voted best in Town! Your choice of grilled, blackened or jerked fish topped with cabbage, cheddar and jack cheeses, fresh limes, and your choice of pico de gallo or mango salsa. Gulf Shrimp & pollock lightly fried and topped with cabbage, cheddar and jack cheeses, fresh limes, and your choice of pico de gallo or mango salsa. Lightly marinated tuna filet seasoned to your liking. Grilled, blackened, jerked or sesame seared. Cooked rare unless specified. Topped with cabbage, cheddar and jack cheeses, fresh limes, and your choice of pico de gallo or mango salsa. Ground beef slowly cooked and seasoned to perfection topped with lettuce, cheddar and jack cheeses, fresh limes, and your choice of pico de gallo or mango salsa. Tender marinated chicken grilled, blackened or jerked and topped with lettuce, cheddar and jack cheeses, fresh limes, and your choice of pico de gallo or mango salsa. Marinated USDA choice filet, thinly sliced and topped with lettuce, cheddar and jack cheeses, fresh limes, and your choice of pico de gallo or mango salsa. Marinated Portobello mushroom with onions & peppers and topped with lettuce, cheddar and jack cheeses, fresh limes, and your choice of pico de gallo or mango salsa. A house favorite! Succulent shrimp prepared with your choice of any of our taco seasonings. 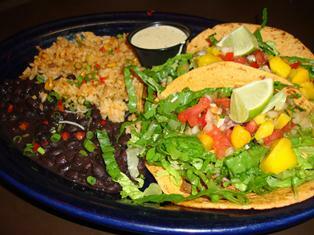 Topped with lettuce, cheddar and jack cheeses, fresh limes, and your choice of pico de gallo or mango salsa. One Chile Relleno Camarones, one Enchilada (chicken or Del mar) and one Fish, Chicken, or Beef taco with black beans and rice. You can also get a chicken, beef, garden, fish, steak or shrimp taco by itself, with a side of rice and beans too.